I have little to say these days. This is what things look like. joanie's resting, i am not. while i was bike parking last week, joanie decided to take a rest along a wall for her closeup. the other day someone asked what the ride is called that i am doing on saturday (there is also a populaire to point reyes that day as well). it's called the "cinderella classic" and takes place in the east bay. unfortunately, the skies look grey and wet for that day. while the ride is rain or shine, i am not. it is a female only ride and the metric century we're doing sounds pretty mellow. 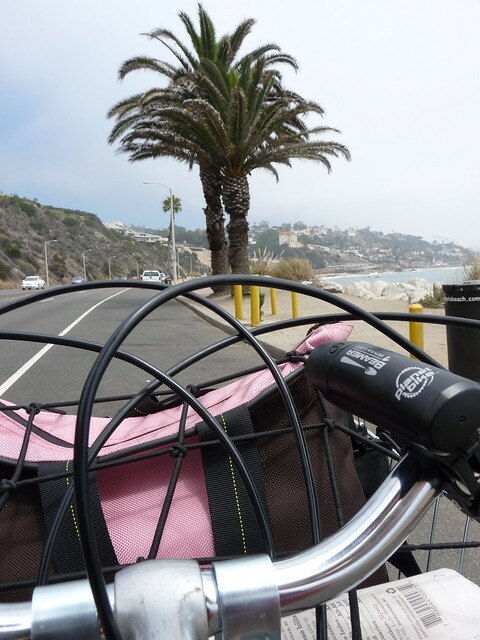 i am doing this in preparation for riding the marin century (100 miles again!). this saturday's ride is with my alumni group! how exciting. took this a couple of days ago while there was some blue sky hanging around in the sky. there is none to be found now. stay dry! also, don't get blown over. that wind is very fierce. but makes for a better workout than no wind. silver lining! also, i believe that is a bullitt bike, but i'm not positive. anyone know? we desperately need rain in the bay area as our winter has been relatively rain-free. heavy rains are expected this weekend. time to cover up and ride or cover up and ride muni. 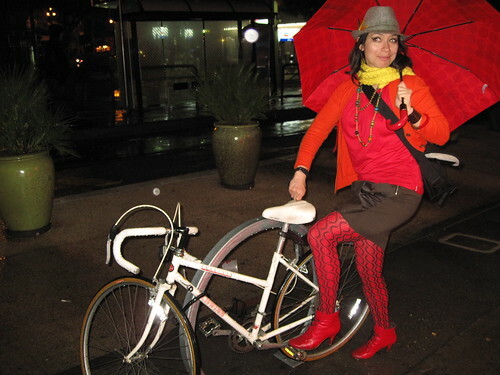 i'm more prepared to ride in rain, however gross rain pants look. sigh. they really do help with keeping dry, just like a raincoat helps out with keeping dry from the knees up. tights are also an awesome option because they dry quickly. have a fantastic weekend y'all! 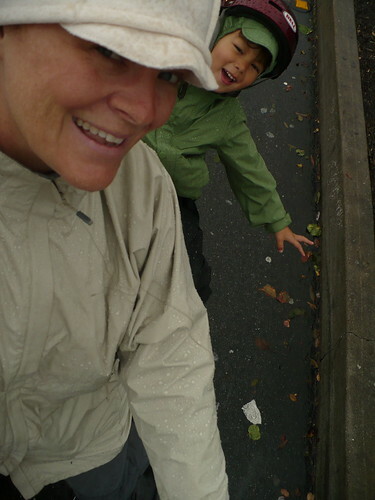 do you have rainy day pics to add to our flickr group? post today! 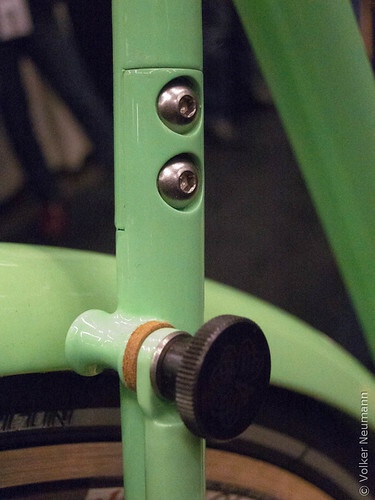 i don't know about y'all, but this week has been super chock full of bikey things. so much so, that during my day job, i've been a whole day off. so in my mind today is friday, but it's really thursday. gaaaaaaaaawd. so what did i do? i went scouting for a route for the upcoming sfbp. upon our deciding to scrap the route and plan a ride with no bike map and with our phones running out of batteries, we knew we had a long night ahead of us. 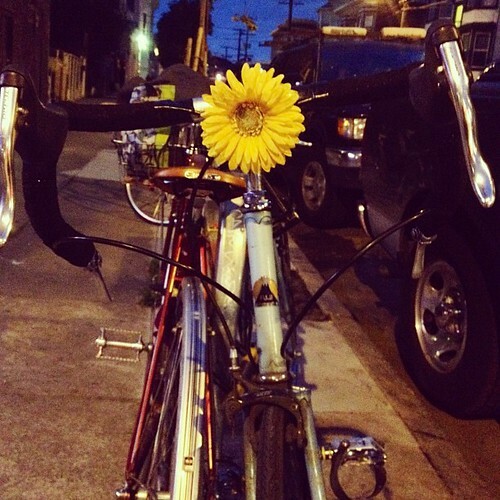 when i went to unlock joanie to go on a ride to the other side of the city, this is what i stumbled upon...a flower at dusk. i got to test out the hdr on my phone camera. 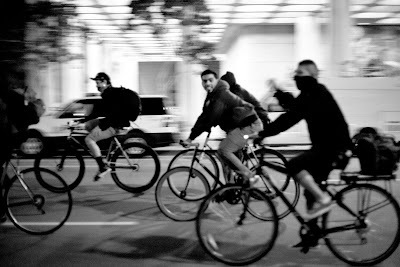 what bikey things did you do after work this week? ay. heard of the large earthquake in mexico today. seems to be minimal damage thus far according to various news sources. so we just want to send a little love from our shake-prone part of the world over to guerrero and DF. ok, carry on. pax y amor. So the Batcyclegentleman is sporting a new "look"
After three years together, my daily bicycle has decided to spice things up with some facial hair. 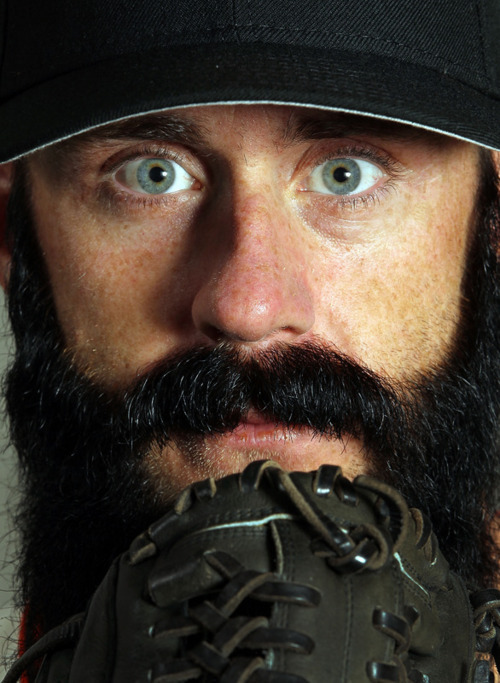 I think it happened, in part, after spending a bit of time at the ballpark under the influence of the Giants. Although he very much wants one, I have had to point out to The Bat that a beard would drag in the front wheel so he will have to stop at the mustache and be happy with that. What do you think? Am I being too conservative here? Should I let him grow a beard, as well? 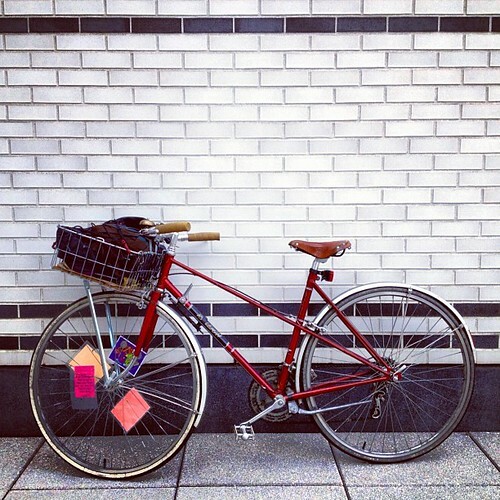 Team loyalty is only one factor in my ride's choice to go hipster. The other would be the fact that I abused my front rack to such an extent that it decided to snap and become useless (the rear cassette has decided to take my rack's advice and fail from neglect, too). 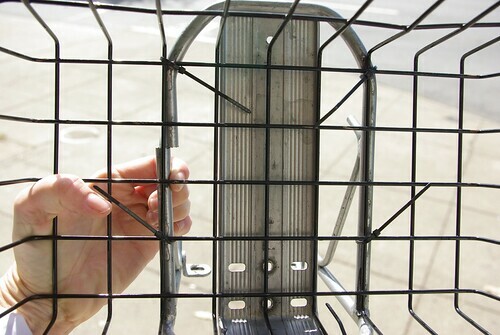 I was about to put a new front rack on the Bat because I love my front basket. I have one on each of my bicycles! Except, I have decided I like my Bat much better without my front basket! Can you hear the collective San Francisco intake of shocked breath at the statement? 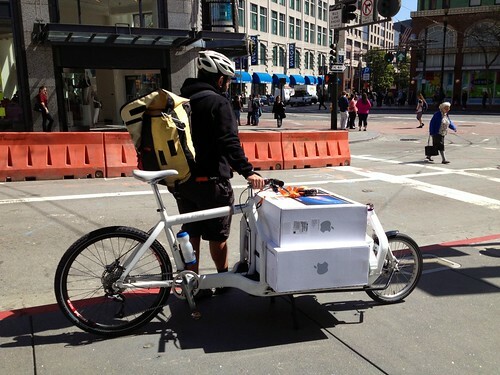 A San Francisco city bicycle sans basket? The scandal!! I may have to turn in my bike card. so earlier this week, the crew and i rolled into oakland, had some muy fufi mexican food (seriously, their queso fundido was insane! 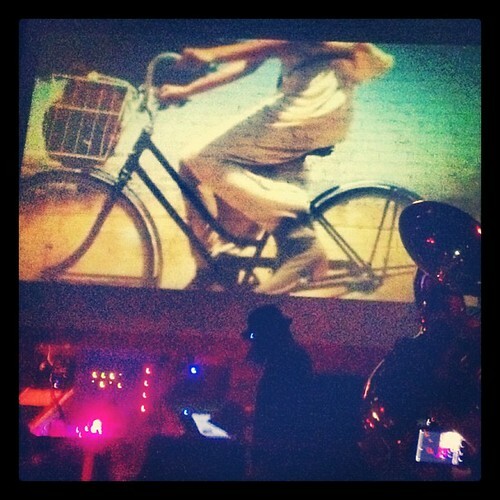 ), and saw nortec collective's bostich + fussible play the new parish. aaaaaaaaaah. it was SO.MUCH.FUN. place was jumping up and down swaying to updated traditional mexican beats. and guess what they had on stage as a video? 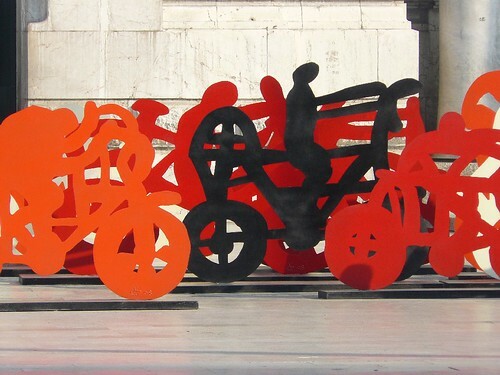 tijuana bike machine. bike machine. bike machine. it's raining cats and dogs and bunnies and elephants out here y'all. if you ride this weekend, have fun living in the now! 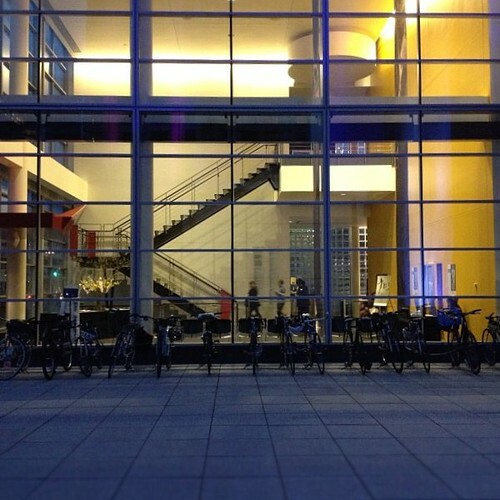 thanks to the amazing iam sterdam for sharing the lovely foto on our flickr group. want to see more? have more pictures to contribute? go over to our flickr group today! 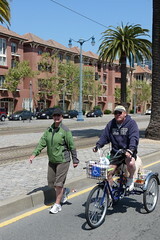 i met my buddy rose when she and i did the tour de cupcake together awhile back. we were in it to win it, then just ended up paling around as we ate cupcakes throughout the city. pretty fun way to pass the time. rose has a new kickstarter proposal, featured on none other than the ever-present, curmudgeonly, and high-trafficked BSNYC a few weeks ago when her project was new. friend to the blog, richard, also featured hot bike over on cyclelicious. the kickstarter project's time is almost up, and the project is now funded. yay. but you can always contribute more to help out the beginnings of this new woman-owned, and powered, venture. i asked rose some questions...here they are. enjoy. When I first moved to the Bay Area I lived in the Marin Headlands. 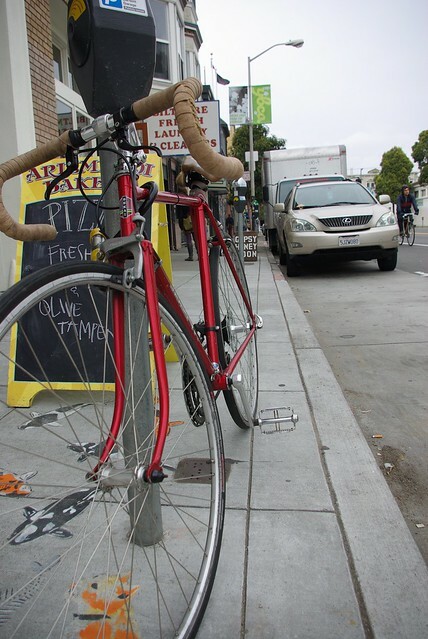 I was so curious about SF that I would ride my bike into town and explore on the weekends. 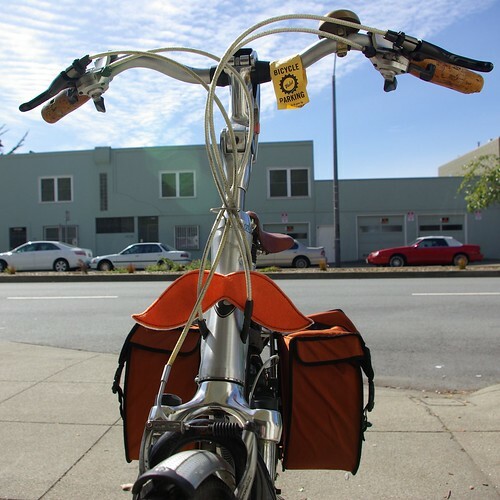 It was about an hour ride from my house to the mission, and through the presidio none the less. 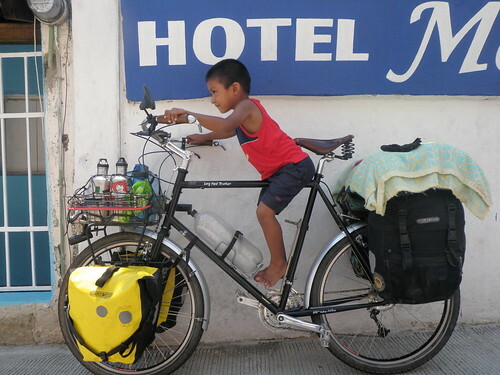 I fell in love with riding, with carrying all of the supplies I needed for many days (hello bike touring! 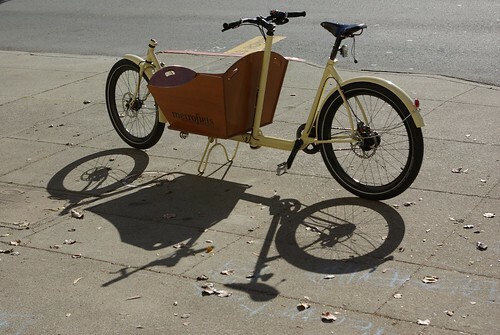 ), and with accessing the world without a car! WHEN DID YOU GET THE IDEA TO BLEND TACOS AND BIKES? For over 3 years I have been making, selling and trading spreads, sauces and dips through my little food project, Apothocurious. As I was trying to figure out how to make these foods easily consumable within the party atmosphere, a friend recommended I set up a Taco stand. I have realized the corn tortilla is the perfect (vegan and gluten free) vehicle for the next step of my project. 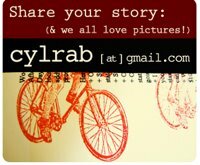 WE'RE BIG INTO COMMUNITY HERE AT CYLRAB. HOW DOES COMMUNITY FACTOR INTO THIS PROJECT? When Apothocurious was first created, it was a weekly delivery service. I knew I wanted people to come together over food, so Apothocurious also hosted and catered community events (and continues to do so, Queer Camp, Secret Garden, and other fun events are coming up this spring). With Hot Bike! 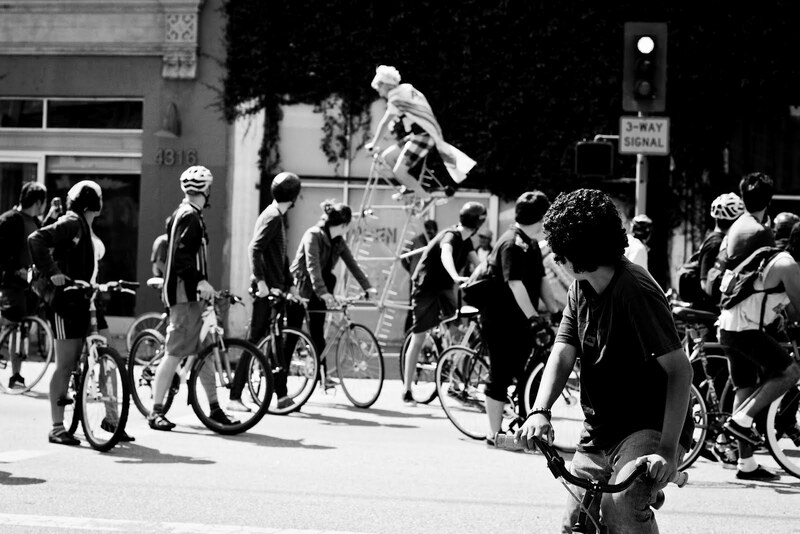 we will be able to have community gatherings that celebrate food, bikes, and people ANYWHERE! WHAT CAN OUR READERS DO? They can contribute to the kickstarter(link)-we reached our goal, and folks are continuing to give! Any $1, $5, or $10 donation will help support all the fun events Apothocurious organizes. They can follow us on Twitter, Facebook, or join the mailing list. Check out the website, Apothocurious.com, we offer cooking classes, private chef services, and food consultation. looks like the winter is FINALLY hitting SF this week just before it's technically not winter anymore. time to get those errands in, and time to sit around in a parklet before the rain sends us inside, or at least keeps cute bikes from public parklets. 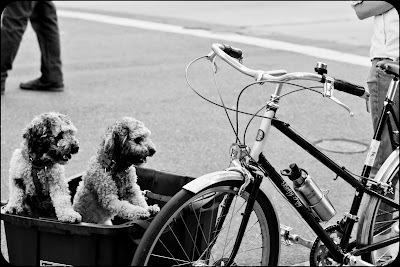 hope you bay area bikey peeps got that ride in this weekend! enjoy the day y'all! happy monday. 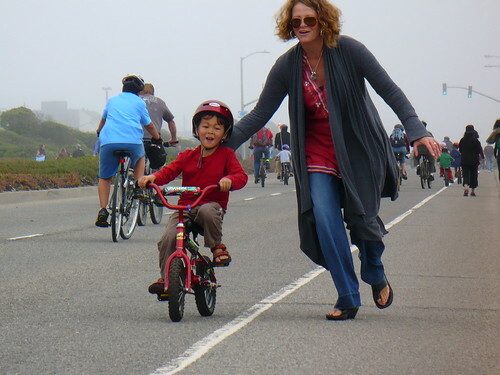 sunday streets is back in SF starting this sunday! i will be gone walking among green things not too far away...so unfortunately i will miss it. i do believe ade is skipping out on portlandia to take pics and celebrate with SF. 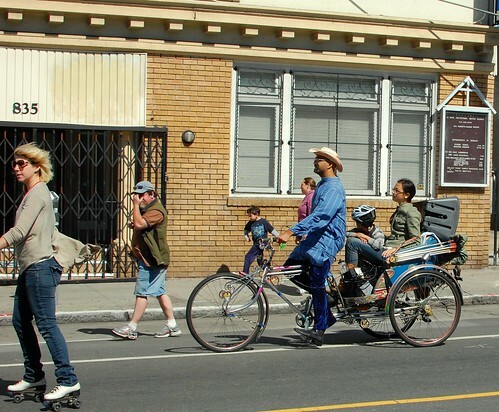 i'm very excited for sunday streets because it coincides nicely with san francisco's recent bikey friendly legislation. 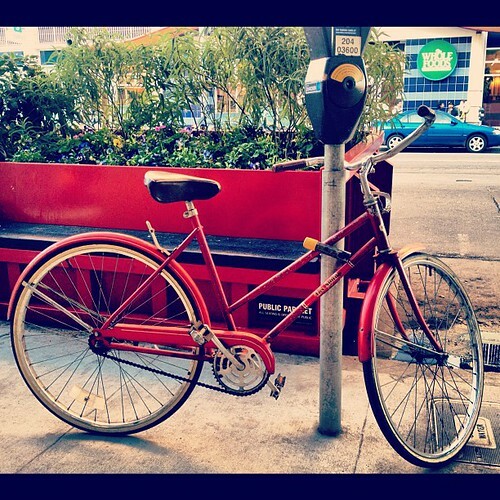 some say it is the strongest bike friendly legislation in the U.S.
the ordinance requires that downtown building managers have secure indoor bicycle parking for employees either in their building or guarantee secure parking in a building within a few blocks! a frequent complaint to riding bikes to work is fear of theft. i carry two ulocks for that very reason. what a relief to so many future bike commuters. 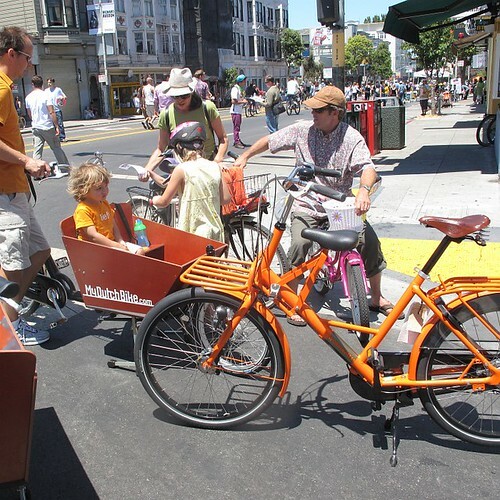 why not celebrate that with the extremely popular, and expanding, sunday streets. 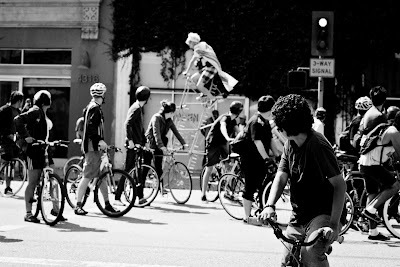 last year sunday streets was in 8 locations. this year, we will have 10! Don't watch this at work. Unless you work somewhere where this kind of thing is OK. In which case, pump it up! Those of us in SF will have a little bit of a chuckle over this. wellwell. you probably have seen a bunch of pictures already from this show. this was a very last minute decision for me to go, but it was just SOCLOSE to sf. so we rented a zipcar (cheaper than amtrak, faster than bike unfortunately), and off we went in the wee hours of saturday morning to go to the show. 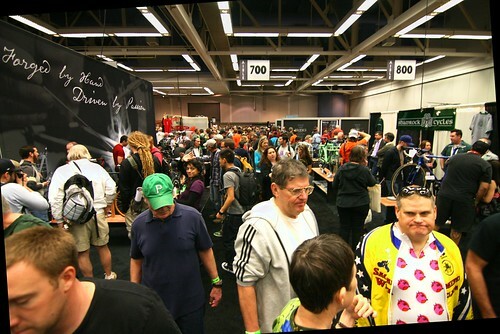 when we heard "it is now 10 minutes until 6 o'clock," is when we realized we had been standing and looking at the most gorgeous bikes i've seen for just over SEVEN HOURS. 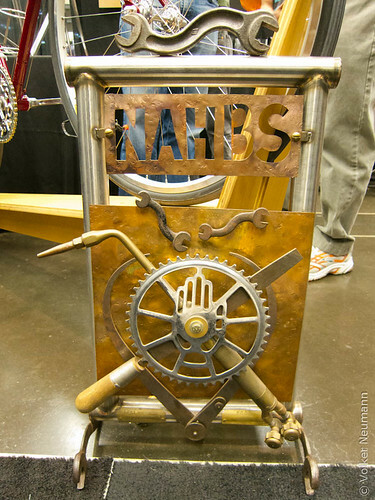 my favorite was probably this one made by bishop bikes. 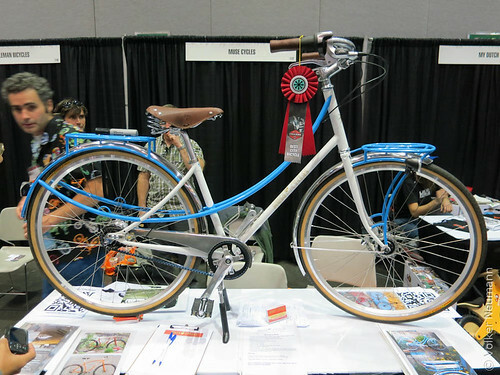 it eventually won best lugged bike. 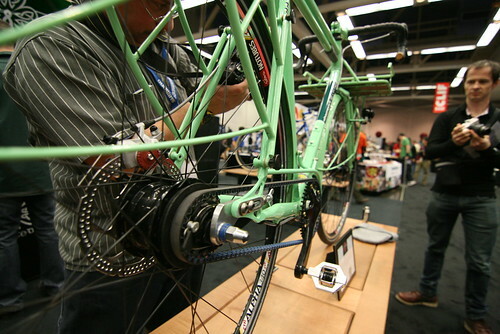 another one that stood out to me was the shamrock cycles cross/commuter bike. 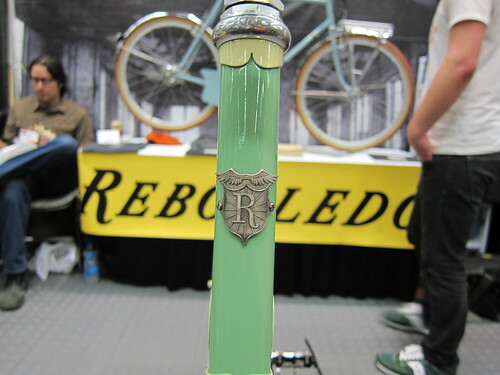 i'm not crazy about that color, but the idea is awesome. 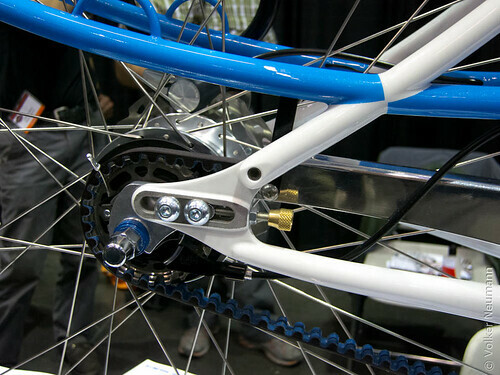 can easily remove the racks/fenders. 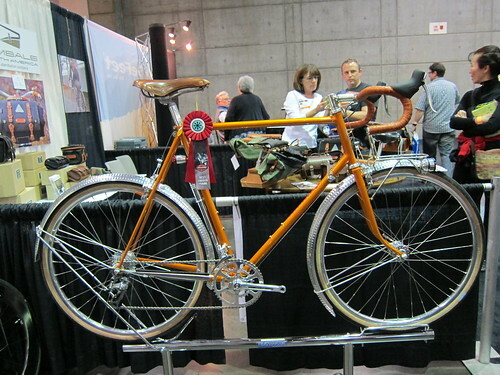 and then this won best city bike. 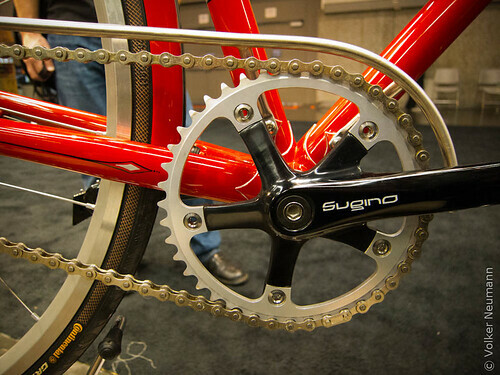 any surprise it's a (near) mixte frame? didn't think so. 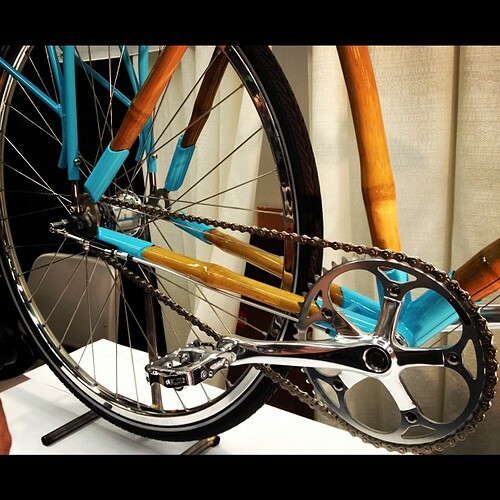 saw so many bamboo bikes, carbon/ti tandems, belt drives, internal gear hubs, integrated [fill in the blank], accessories, you name it. we saw it. oh, except female framebuilders. didn't really see any of those. i hope they were on their lunch break while i was visiting the booth. ahem. 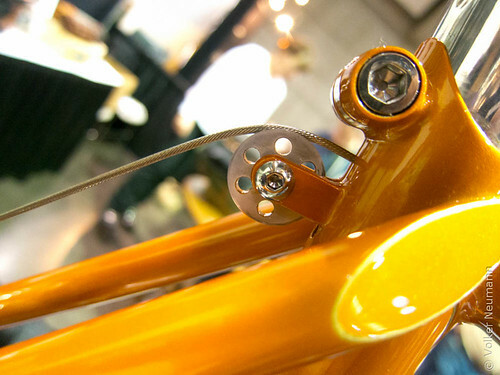 we also chatted with the people (metrofiets) that made ade's frame! 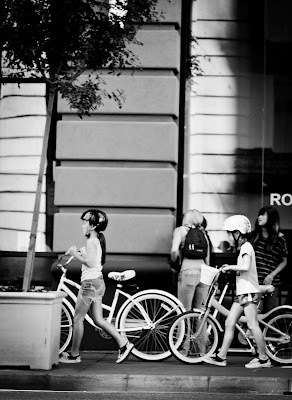 i'm still swooning over the bikes....maybe drooling a little bit too. i know it's hard for framebuilders to get out to the show all the time, but would be great to see more women framebuilders represented in the coming years. so glad we decided to go 6 hours before we left sf. thanks to prawnpie, owlboogie and richard for the pics from the show! 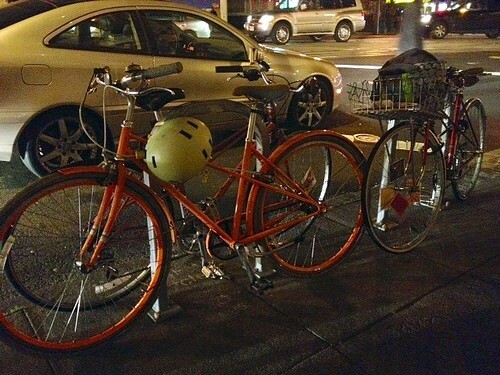 things were looking a little mixte-crazy over on a bike rack at a busy intersection in SF recently. they must have put up a sign saying "mixte only plz. kthx." it's not every day you see three mixtes parked up on bike racks. i would love to see that happen more often. mixture of the old and the new. it's all good.